Are we actually trying to add to the public’s growing belief that they don’t need libraries because everything is on the internet? Do we want people to come to the library? Have we stopped believing that the physical library offers a special experience that people need and want? Each of the seven contributors to the book, experienced in both academic and public libraries, offer answers to these questions, approaching the subject from different viewpoints. Just as they are agreed upon the causes of the problem, so they seem to be agreed upon ways in which the problem can be tackled, and these ways are not theoretical, they are drawn from practical experience, from surveys of usage, attempts to ‘market’ a library service, and, in the case of some of the contributors, through experience as consultants on library planning. 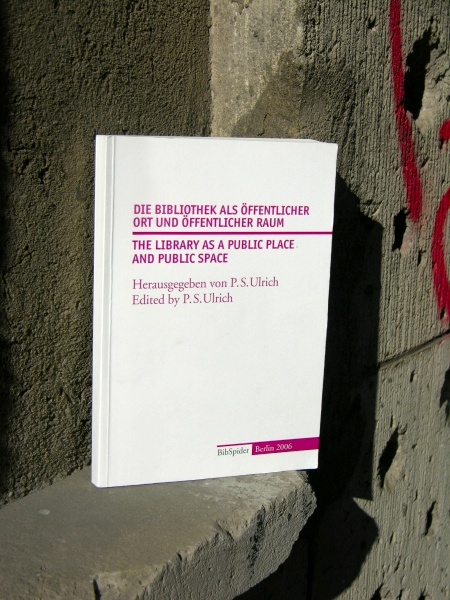 The idea for the book came about following a conference held in Berlin in 2003 which, in the words of Paul S. Ulrich in his introduction to the book, „was an attempt to disseminate the experiences New Yorkers had with their New York Public Library following 11 September”. The keynote address at the conference was given by Denise Hibay, Assistant Chief Librarian for Collection Development in the New York Public Library’s Research Division. That address is reproduced in the book and forms a focal centre for the other contributions. Library use increased considerably in the days following 11 September, with the conclusion being drawn that ‘the most significant and powerful act of the library was the simplest. And that was to open its doors on the days following the attacks. The library served as a stable and reassuring presence for neighbourhood residents’. Hopefully most librarians will not have to undergo the trauma and tragedy of 11 September and its aftermath, but the message is clear and straightforward, libraries have an important role to play in society and those working in them have a duty to make those libraries accessible to all who want to use them. Whatever type of library is concerned, it should be a place people want to come to, not only to use its wide variety of resources, but to meet and socialise. In the preface to the book we are told that ‘the Staatsbibliothek (State Library) in Berlin has become a „marriage market” place’. Then, in the final chapter, it is stated that in the USA „more than one romance has started in a library”. Who said libraries were only for fuddy-duddies? The greater part of the book looks at ways in which libraries make it difficult for people to use them and offers suggestions as to how this can be overcome. In his chapter Paul S. Ulrich goes as far as suggesting that all newly qualified librarians might benefit from attending a course on how to make a library unusable as a way of getting them to look at the library from the user’s point of view. Now there is a great idea! Marylaine Block devotes a chapter getting back to basics by looking at the need to rethink the model library now that people will be using it less for information because of the Internet. Her message is that librarians should „start thinking about what society needs more of at this point, that we are uniquely qualified to provide”, going on to detail what those are. In the following chapter Michael Dewe discusses a number of ways in which the public library can be re-invented „in a way that will dispel any negative images and broaden its appeal”. He is as concerned as much with the external setting of the library as organisation within the library itself. Myoung Wilson and Farideh Tehrani, librarians at Rutgers University, New Jersey, describe ways in which their service has attempted to market what it has to offer to students, with examples ranging from integrating library instruction with course work (very successful) to adverts in student buses (not so successful). In addition, they provide information analysing results. Their conclusion is that the „current marketing challenge for academic libraries is to understand the elusive ways that the Net generation of students and faculty use digital and print libraries”. This is a message librarians in other types of institutions should ponder and act upon. But the idea that all people would become nerds has been revealed to be nothing more than the wishful thinking of the nerds themselves. If what the majority of the writers in this book offer is a challenge, then one chapter gives a vivid description of how one library service was able to rise to that challenge and re-invent itself on a grand scale. This is in the chapter written by Alfred Pfoser, Director of Vienna Public Libraries, in which he provides information on the new main public library in Vienna, opened in April 2003. Following the opening there was, as expected, a large increase in public usage. This has been maintained to date. Surprisingly, in addition to that continued increase at the new main library, there has been a 15 % increase in public usage at branch libraries also. Various factors seem to have contributed to this: location, design of the main building, a doubling of the size of the library stock, staff reorganization together with outsourcing of some activities, marketing through the creation of a strong PR department, enlargement of the computer services department, and providing space and time for continuing education and special events within the library. As most of the writers in the book are at pains to point out, libraries have to exist under certain restraints, most noticeably those of a financial kind. Not every library service has the opportunity to re-invent itself through the planning and bringing into being of a new building. On the other hand, as this book is at great pains to point out, there are many ways in which a library can be re-invented to bring it more into line with contemporary needs. The ideas and information presented in this book are well-written and clearly presented, and provide more than enough ammunition for those librarians to fire at their governing bodies when trying to obtain permission – and finance – to begin the task of re-invention. As such it is strongly recommended. Read it and who knows, you might be able to re-invent yourself and find romance in the library. As this book makes clear, it’s an international phenomenon.